Strong job growth has driven the unemployment rate down to 4.3%- the lowest level since May 1975. However, subdued quarterly GDP growth of only 0.1% in Scotland during the second quarter of 2017 has limited annual wage growth to 2.1%. Coupled with consumer price inflation rising to 3.0%, real wages are continuing to fall. Lower real wage growth has continued to improve employer sentiment since the EU referendum, which provides an early indication of future office demand. Of the FTSE 100 CFOs surveyed by Deloitte at end Q2 2017, 9% expected to increase hiring over the next 12 months, a marked increase on the 1% recorded immediately post Brexit. Scotland as a whole is expected to see office based employment grow at a slower rate than the UK average of 4.6% over the next five years. However, both Edinburgh (5.0%) and Glasgow (4.7%) are set to see office based employment outperform the national average during this period, driven by strong growth in professional, science and tech sectors. Whereas decision makers sat on their hands during the second half of 2016, occupiers have realised that “Brexit” is a process, not an event and occupational decisions must continue to be made. Over seven months on from triggering Article 50, the self imposed deadline of March 2019 to leave the EU is rapidly approaching. Take-up in the Scottish office market reached 393,000 sq ft during Q3 2017 in what is usually a quieter quarter. With 1.8m sq ft of space taken so far this year, Scotland's take-up is on course to exceed the 10-year average of 2.1m sq ft by the year end. Aberdeen office take-up reached 84,000 sq ft during the third quarter of 2017, amounting to 325,000 sq ft for the year to date, over twice the total at this stage last year (Graph 1). This was largely driven by the long awaited confirmation of Chrysaor signing for 48,000 sq ft on a 10-year lease at The Capitol (below). During 2017, 78% of Aberdeen's take-up has been from oil and gas related industries, up from 17% during 2016. With Brent Crude oil remaining constant at $50-$55 per barrel, our forecast for 2017 take-up was revised upwards to 400,000 sq ft (see Dan Smith's key themes, below). 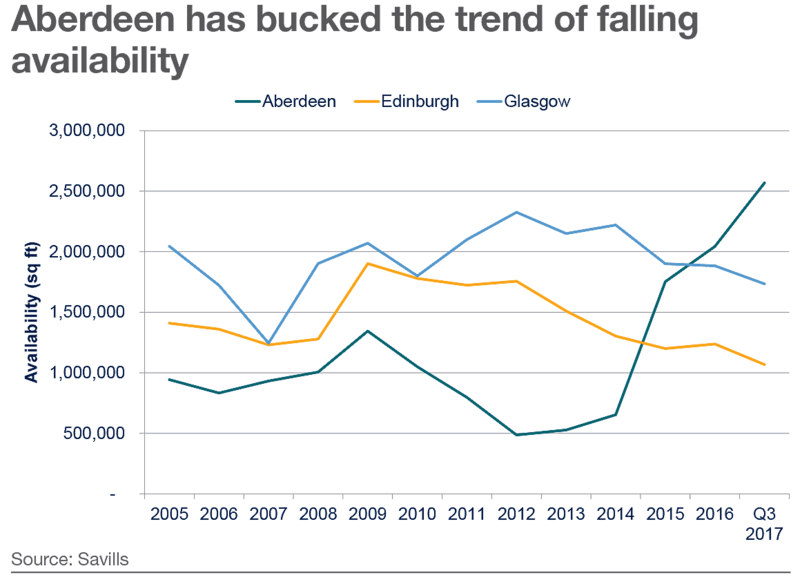 Despite the increase in take-up, Aberdeen's availability rose to 2.6m sq ft over the past quarter, largely down to the practical completion of Marischal Square and The Silver Fin Building. 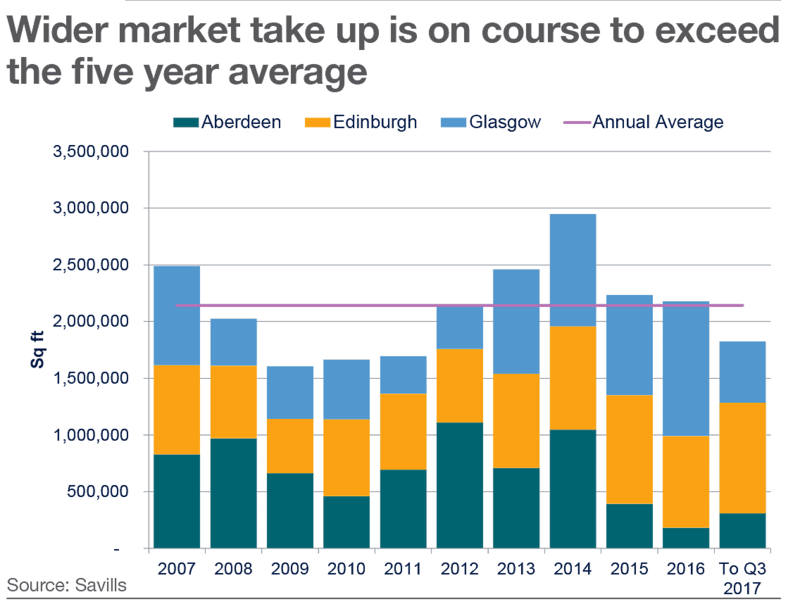 We believe that availability has now peaked in the Aberdeen market, with no more speculative developments in the pipeline. We expect headline rents for the very best space to remain in excess of £30 per sq ft, with incentives continuing to challenge landlords. Edinburgh's wider market take-up for Q1–Q3 2017 reached 976,000 sq ft, already 9% above the five-year annual average. 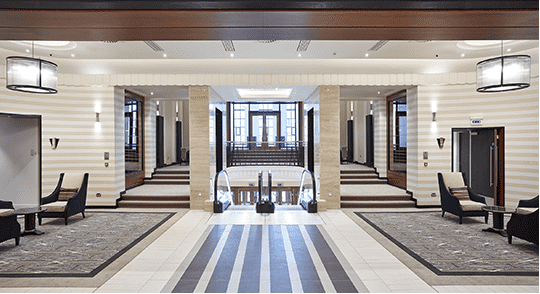 701,000 sq ft of this was taken in the city centre, which was boosted by Standard Life Aberdeen's 69,000 sq ft letting of 10 George Street, which is set to undergo a comprehensive refurbishment early next year, once current tenant EY vacates for Atria One. Edinburgh is the only Scottish city with office developments under way. There is currently 100,000 sq ft of new space under construction in the city centre, consisting of The Mint (60,000 sq ft) and 2 Semple Street (40,000 sq ft), set to be delivered by the second quarter of 2019. BAM Properties and Hermes have also announced plans to speculatively develop 122,000 sq ft of Grade A space at Capital Square, which is expected to complete during early 2020. However, this is collectively still only enough for around one year of Grade A take-up at current levels. The shortage of Grade A space in Edinburgh points to the possibility of a £0.50 per sq ft increase in top rents to £34 per sq ft by the end of the year for a top floor suite. Take-up in the wider Glasgow market reached 539,000 sq ft for Q1–Q3 2017, of which 290,000 sq ft was taken in the city centre. Only 62,000 sq ft was taken in the city centre in Q3 2017, with all deals below 10,000 sq ft. In fact, 56% of the space taken in the city centre so far this year has been in lot sizes below 10,000 sq ft, above the five-year average of 44%. Though, we will see a boost in take up volumes during the final quarter of 2017 after the Government Property Unit (GPU) pre-let 180,000 sq ft at Atlantic Square as part of its national relocation plan. Out of town, Glasgow take-up remains strong, reaching 249,000 sq ft, 3% above the five-year average for this stage in the year. Glasgow's city centre availability fell to 1.7m sq ft (Graph 2) during Q3 2017, of which only 471,000 sq ft is Grade A specification. This is only 18 months worth of supply at average levels of Grade A take-up. We expect top rents to remain stable at £30 per sq ft until new speculative developments are announced. There are however a number of refurbished schemes which are set to provide 192,000 sq ft of space by the end of Q1 2018, which could see an increase in average rents over the next 12 months. Top refurbished rents have risen from £23 to £28 per sq ft for the best space over the past five years, closing the differential with new build rents to only £2 per sq ft.
Office investment volumes reached £376m as at the third quarter of 2017 (Graph 3), 9% below the 10-year average for this stage in the year. As landlords are looking to hold long income, there is a shortage of on-market stock. 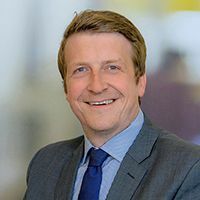 In fact, around 75% of office investment deals have been agreed off market so far this year, showing the increasing competition among purchasers for well-let assets. Property companies remain the most active investor type by volume so far this year, with £180m acquired. Wirefox Investments acquired City Park in the east end of Glasgow for £41m early during Q4 2017, after purchasing Capella for £43.5m the previous quarter. UBS Asset Management acquired Quartermile 2 for £28.5m, reflecting a 5.4% yield during Q3 2017, whilst Lonestar have since brought business park, Skypark to market during the final quarter of 2017 for an asking price of £80m. kamaco Research have tracked prime office yields across the Scottish cities over the past five years and analysed the impact that political scenarios have had (Graph 4). 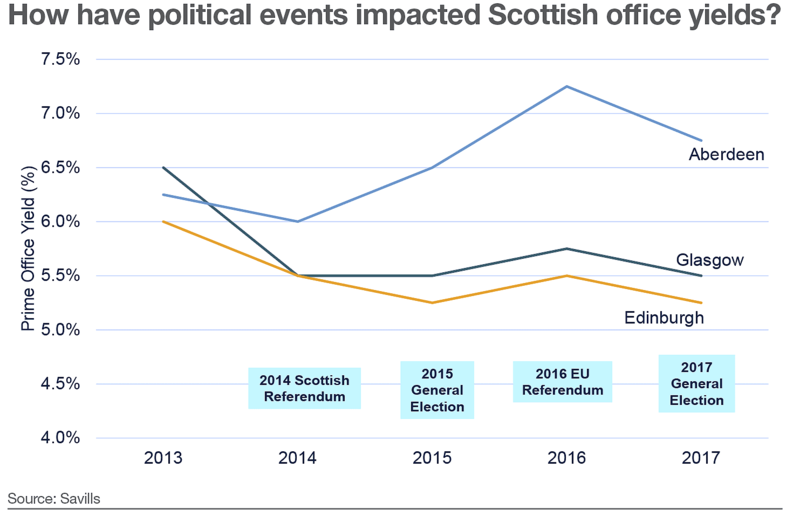 GRAPH 4How have political events impacted Scottish office yields? Whilst the rest of UK yields have been on a steady inward trend during 2015, Scottish office yields moved out after the 2015 General Election. The 2016 EU Referendum increased further speculation regarding Scottish independence, though the Scottish National Party's loss of seats in the 2017 General Election has turned investor focus back towards Scotland, hardening prime yields. During Q3 2017, Glasgow's prime yields moved in 25 basis points (bps) to 5.5%, which kamaco forecast in the previous Scottish Office Market Spotlight. This has been most heavily driven by the return of the UK funds who have been more bearish to indyref2 than the overseas investors. Many investors now see Scottish offices as more defensive to Brexit than central London offices following the 2017 General Election. Overseas investors, particularly German funds, are increasingly open to investing in Scotland and are looking outside London for more attractive yields. This structural change could close the yield gap between Scotland and the rest of UK regions. kamaco expect prime yields to hold firm across the three Scottish cities for the remainder of 2017. The improvement in market sentiment and deal activity maintains the positive trajectory we predicted and we continue to see churn in the office market from both new and existing occupiers. The reason for the increase in activity is largely a result of lease events, improving energy sector confidence and increased landlord flexibility relative to lease terms. Combined, these factors have allowed occupiers to upgrade their office space in a ‘flight to quality’ which was previously not possible because of the acute lack of stock between 2010 and 2014. At one point in 2013, there was only 10,000 sq ft of Grade A office space available when active demand was in excess of 1m sq ft. This market imbalance resulted in the lifespan of many offices which were otherwise economically and/or functionally obsolete to be extended. Now that the market has softened, and the supply and demand dynamic has changed, there is a notable increase in options for tenants. 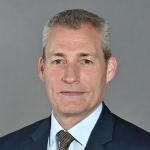 Total, LR Senergy and Chrysaor Energy are all recent examples of occupiers capitalising on softer market conditions to upgrade the quality of their offices. Total’s former HQ at Crawpeel Road is reportedly set for demolition and redevelopment to industrial use. 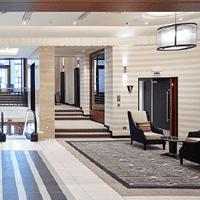 Meanwhile, LR Senergy’s former home at Denburn House has been acquired by a Jersey-based hotel operator, who intends to put it to alternative use. We anticipate that increases in local authority rates will exacerbate the liabilities on some offices and will lead to many more landlords of poorly specified, or poorly located office buildings choosing demolition over the ongoing burden of paying vacant rates liabilities in an uncertain letting market. One notable example is the recent demolition of an office block in Dyce by local developer Malcolm Allan. With the completion of the Silver Fin Building (135,000 sq ft) and Muse and Aviva’s Marischal Square (175,000 sq ft), we have seen an unprecedented supply of quality space in Aberdeen city centre, further marginalising older stock. Our prediction for total take-up in 2017 has now been revised up from 350,000 sq ft to 400,000 sq ft which will be a 70% improvement on 2016. We also expect to witness a reduction in the availability of Grade A space and continued improvement of the supply to demand ratio.